(Nanowerk News) The study of how atoms radioactively decay has played a critical role in developing the standard model, our modern understanding of the most basic forces and particles constituting our universe. Experiments investigating one form of decay, where a radioactive nucleus emits a beta particle to become more stable, have led to revolutionary ideas that are part of the standard model. The most surprising result from beta decay to date is the discovery that nature is not ambidextrous, but appears to be “left-handed.” Handedness refers to a particle’s spin; if you curl the fingers of your left hand to follow the spin and your thumb points along the direction of motion, the particle is left-handed. Using lasers and magnetic fields, researchers are now able to suspend clouds of atoms in a small volume in space and polarize them with very high efficiency. These pioneering techniques provide an ideal source of short-lived atoms, allowing parameters of the beta decay to be measured with great precision. These measurements are sensitive to a wide variety of “new physics”—including whether or not nature is exclusively left-handed —which are predicted by many potential successors to the standard model, such as supersymmetry. Using the TRIUMF Neutral Atom Trap (TRINAT) facility, a collaboration from Texas A&M University, TRIUMF (Canada's national particle accelerator center), Tel Aviv University, and the University of Manitoba combined magneto-optical trapping and optical pumping techniques to produce an ideal source of short-lived potassium-37 atoms. The magneto-optical trap is extremely selective, only confining the isotope of interest. It provides a very compact, cold cloud of highly polarized atoms that decay from a very shallow trap within an exceptionally open geometry. This allows the researchers to measure the momenta of both the recoil and emitted beta daughters in a nearly background-free environment with minimal beta scattering effects. Two beta telescopes, placed along the polarization axis, observe the number of beta particles emitted parallel and anti-parallel to the nuclear polarization. The direction of the polarization is easily reversed by simply changing the sign of the circularly polarized optical-pumping light. This is an ideal situation for determining the correlation of the beta particle with the initial nuclear spin, that is, the beta asymmetry parameter. 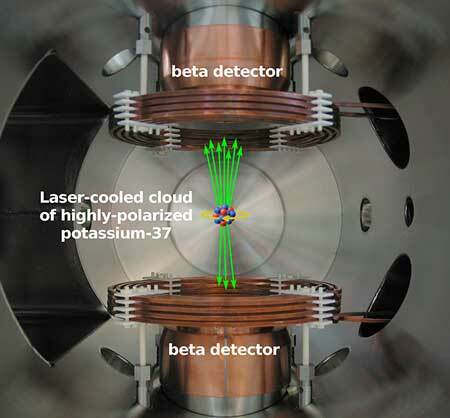 The asymmetry observed in the beta detectors determines the beta asymmetry parameter for potassium-37 to within 0.3 percent of its value. This is the best relative accuracy of any beta-asymmetry measurement in a nucleus or the neutron and is in agreement with the standard model prediction. This experiment has increased sensitivity to new physics compared to other nuclear searches. It improves the determination of the quark flavor changing strength parameter, Vud, for this nucleus by a factor of 4. The researchers have identified ways to improve the precision to better than a part-per-thousand, at which point the result will be complementary to searches for new physics at large-scale facilities such as the Large Hadron Collider. In addition to improving the beta asymmetry parameter measurement, researchers will use TRINAT to measure other polarized and unpolarized correlation parameters.